The Katona twins - Peter and Zoltan Katona - are a Hungarian guitar duo that has made something of a speciality of music for two guitars. Previous discs have included arrangements of music by Handel and Scarlatti, so it comes as no surprise that this new disc explores Vivaldi’s guitar music. Except, of course, Vivaldi didn’t write any guitar music; strictly he wrote a number of pieces for mandolin and lute. The balance between solo instrumentalist and accompanying ensemble must always have been something of a challenge in mandolin and lute concertos. 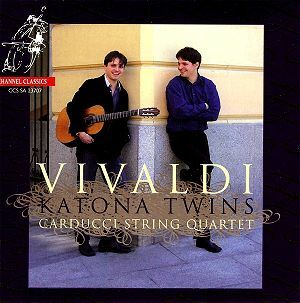 On this disc, the Katona twins solve the problem by reducing the accompaniment to one instrument per part. In addition to the double concerto for mandolin and lute, they play two solo concertos written originally for lute and for mandolin. In these solo concerti, the second guitarist plays the continuo part. In all three concertos, the results sound impressively balanced and relaxed, as if we were listening to genuine chamber music. The Carducci Quartet play in a strong, upfront manner which suits the pieces; though their rhythms are quite sprung there is no feeling of them aping period practice. What we get is well played, intelligently phrased modern style Vivaldi. The concerto for two guitars is the only concerto which includes virtuoso passages for two guitars. The brothers play these brilliantly and are exceptionally well balanced. In all the pieces there is a sense of continuity between the two guitarists as if we were listening to a single player. Though the guitar is quite a restrained instrument these performances are by no means understated. The string playing is gutsy and well matched by the guitarists. Many of the faster movements are melodically uplifting. When transcribing the pieces for guitar, the Katona twins have experimented with different techniques of playing the arpeggiated passages. Normally guitar technique for such passages differs from a mandolin, but here the twins have approximated something closer to the mandolin technique which probably accounts for the brightness and liveliness of the guitar passages. The concertos are paired with two trio sonatas by Vivaldi. Though Vivaldi wrote trio sonatas for one or two violins and basso continuo, he also wrote trio sonatas for lute, violin and basso continuo. The Katona twins have arranged two of these for two guitars, the second guitar taking the basso continuo part. Vivaldi’s trio sonatas are more melodic than Bach’s, with a reliance on texture rather than polyphonic lines. This is emphasised when the violin and continuo cello are removed so that the accompanying figures become even more textural. The results are pleasantly attractive and convince as guitar music. The final piece on the disc is a sonata by Sylvius Leopold Weiss, a member of the Dresdener Hofkapelle and contemporary of Bach’s. Bach might even have composed his lute suites as a result of meeting Weiss. Weiss wrote a number of lute duets, but unfortunately none has survived complete, the second parts are missing. German lute player Karl-Ernst Schroder has reconstructed the missing lute parts and the Katona twins have used his reconstructions as the basis for their guitar version. The resulting piece seems to be highly dependent on a single melodic line, articulated on one guitar, with accompaniment from the other. The results are attractive and charming chamber music for the delight of the participating musicians rather than grand concert music. But this is an interesting addition to the concert repertoire for guitars. The Katona twins provide a well structured programme with some fine guitar playing. The disc will not necessarily please purists, but everyone else can simply enjoy a fine recital.